Weird sightings of cryptozoological and mythological creatures abound around the globe. Sometimes the creatures simply appear and then vanish again, content merely to put in an appearance. Other times they make themselves known to entire cities, and leave their mark. Damaged buildings. Scars on the landscape. The occasional death. Then suddenly, the death toll escalates. One by one Hellboy and his friends at the BPRD are dispatched to avert disaster. Hellboy encounters a dragon in Brazil. Abe Sapien tackles a giant alligator in Venice. Liz Sherman faces off against a phoenix in the Mediterranean. 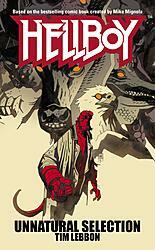 An original novel set in the world of Mike Mignola’s HELLBOY! Just come back from the Philippines, where I saw this book on sale (US edition) in absolutely every bookshop I went into around the country. Good read, and I recommended it to a few people too! Thanks Damon! Glad to see they’re getting themselves some Lebbon.